We are very proud of our e-liquid’s. 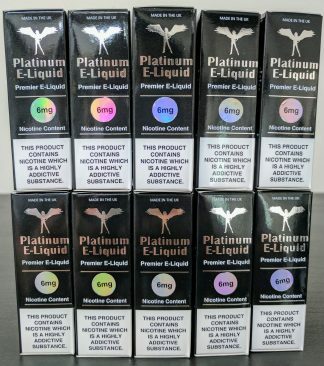 Building Our E-liquid branding, our Platinum Range e-liquid is ..
We are very proud of our e-liquids and our E-liquid branding, Our Platinum Range E-liquid is very special. Not only is it designed and produced using the best UK produced products but these products have been brought together after substantial effort and time invested into supplier research and relationship development. Working with the MHRA to ensure our liquids are fully TPD compliant, registered and approved so that we can say with confidence that these fluids are one of the most superior available and we believe offer the very best value for money. However, our opinion is of much less value than our customers. These fluids have been tested thoroughly, including panels of our own customers giving us direction and feedback. 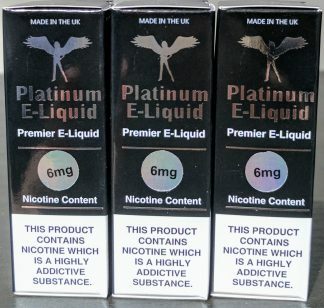 This testing has allowed the Platinum Range to be honed to the level of quality and consistency that we believe supports our claims that Platinum E-Liquid is the best quality UK produced e-liquid offered at a price that delivers on our commitment. GRAPE JUICE One of our most popular flavours a lovely grape vape PLATINUM TOBACCO A dark tobacco flavour, full-bodied and rich to give you all the taste of natural tobacco in a non-harmful way. BUBBLEGUMan original, sweet bubblegum flavour to take you back to the days of sweet shops and 10p mixes LEMON SHERBET clean, mouth-watering Mediterranean lemon flavour, naturally zesty and fresh. A citrusy sensation! Crisp light refreshing Apple. PLATINUM ICED MENTHOL A strong menthol mint for those that prefer a more robust flavour. It’s an ice cold, refreshing and crystal clear taste for that WOW sensation! E-liquid is a consumable and as such cannot be exchanged or refunded once purchased, if you require support with your e-liquid please contact a member of our customer services team. Store in a cool dark area, do not expose to sunlight or high temperatures. e-liquid may discolour or darken once opened, this is natural oxidization and does not affect the performance or flavour. Warning: Keep cartridges and fluid out of reach from children. Nicotine in its pure form is a poison, and can cause harm. All nicotine cartridges and fluid must be kept in a safe place and away from children, as the amount of nicotine in a cartridge, if ingested by a small child could cause serious harm and medical assistance should be sought. Avoid contact with eyes and skin, if this occurs wash immediately with plenty of water. Do not ingest, if swallowed seek medical attention immediately.